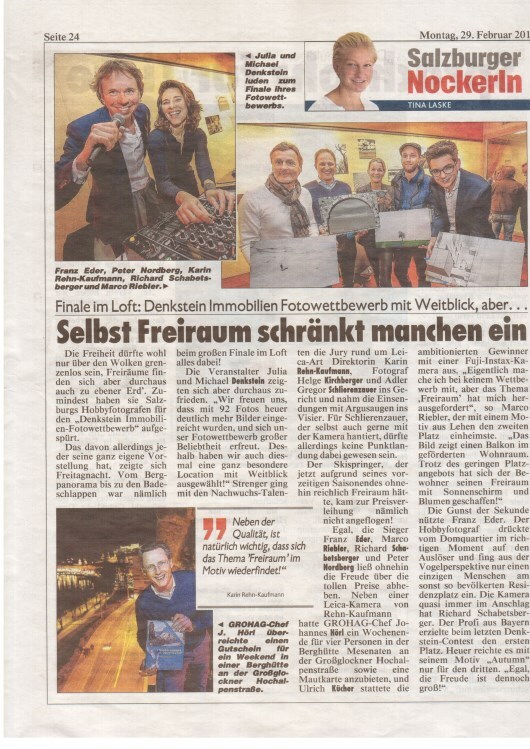 Price giving event second photo competition - "Space is..."
On 26/02/2016 Denkstein real estate invited for the second time for a "Vernissage with music and dance" - the large-scale ceremony of the Denkstein real estate photo contest 2015 - in the trendy loft in Salzburg. The invitation with live music, DJ, free food and drinks followed more than 150 invited guests. In this ocasion the 20 best photos of the theme "Space is ...." were presented. "We are pleased that this year many more photos were submitted and our photo contest enjoys already the 2nd time great popularity," says company CEO Michael Denkstein. With this event, Michael Denkstein wants to demonstrate that not only good business, but also the joint celebrations with friends, customers and partners are very important to him: "It is important to contribute positive - be it for friendship, for society or for successful business. " The selected locations of the Denkstein events have become legendary already. After the photo studio of Helge Kirchberger, an old industrial building in Schallmoos or the Leica Gallery in past events, this time, the loft has been the location for this great event. "A slightly different view of the city, the perfect amenities and all at a dizzy height fits perfectly with our" space "theme" says Michael Denkstein pleased. In May 2015 Denkstein real estates started the second photo contest and invited all hobby, amateur and professional photographers to submit their photos - reflecting what they understund under "Space is...". Thanks to the generosity of the sponsors Leica, Grossglockner High Alpine roads AG (GROHAG) and photo-Kücher prices for the participants of the photo competition " Space is ...." this year were even more attractive. 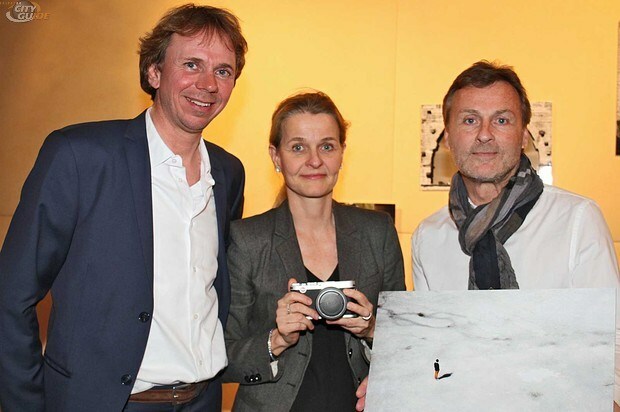 The winner got a Leica camera, personally handed over through Art Director Karin Rehn-Kaufmann. The second, also very attractive price was donated by the GROHAG: a voucher for two nights in the "Mesenaten", the cozy cottage including sauna, high on the Grossglockner. "The motto of free space is very appropriate and important for us, as space and freedom on Austria's highest peak , the Grossglockner High Alpine Road can be experienced in its best version" says GROHAG-General Johannes Hörl. 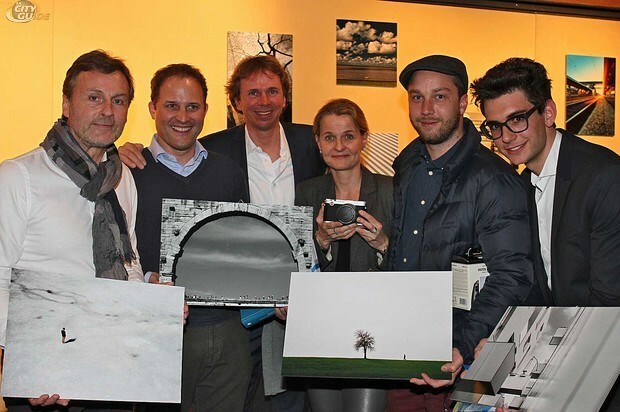 Uli Kücher, chief of photo Kücher, donated the third prize in the form of a Fuji Instax camera worth 80 euros. 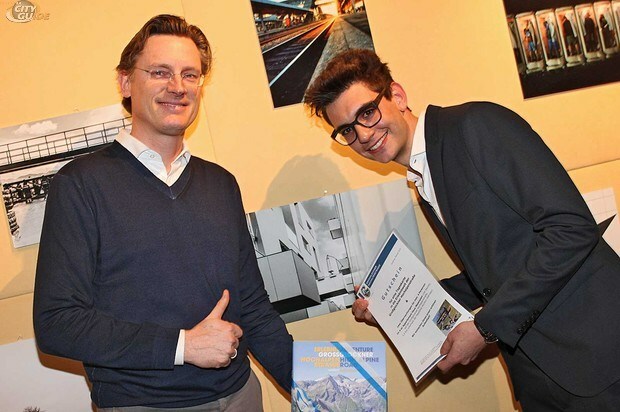 New this year there was also a 4th prize, also donated by the GROHAG: The book "Heritage & Order - The Grossglockner High Alpine Road", including a toll ticket for the adventurous Grossglockner High Alpine Road. This time the jury consisted of ski jumping star and Leica photographer Gregor Schlierenzauer, Leica Style Director Karin Rehn-Kaufman and photographer Helge Kirchberger. The submitted photos are still at this link: Photos Competition 2016. "Also in 2016 there will again be a photo competition" assured Michael Denkstein - but the theme is yet a secret! So we will be waiting anxiously and excited for the third photo competition of Denkstein real estate.